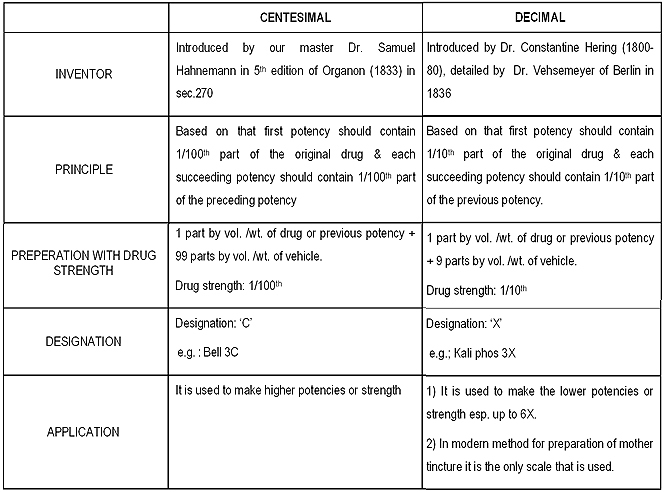 Although Dr. Samuel Hahnemann introduced LM scale of potency in his 6th edition of Organon of Medicine, published after 78 years of his death but it was named (50 millesimal potencies) by Dr. Pierre Schmidt of Geneva and not by Dr. Hahnemann. This scale was named as “50 millesimal potencies”, because of the fact that the material part of the medicine was decreased by 50,000 times for each degree of dynamisation. Even after the publication of 6th edition very few physicians noticed this new change in Organon of Medicine. It was Dr. Pierre Schmidt who took interest to bring it to the notice of mass by writing an article entitled, “The Hidden Treasure of the last Organon” published in July-October 1954 issue of British Homoeopathic Journal. Later in December-January 1955-56 another article was published in the journal of American Institute of Homoeopathy.In 1960 Dr. Chandi Pada Chakraborty of Bangladesh also wrote an article on LM Potency in ‘Hahnemann’. He also prepared 43 medicines in this scale during the period 1958 to 1960. In India Dr.R.P.Patel of Kottayam published his book on LM potency entitled as “My experience with 50 Millesimal Scale of Potency” and edited a quarterly journal “The 50 Millesimal”, published in 1959 for the first time. Another follower, Dr. Charles Pahud of Lozen of France published his article in April 1980 on LM potency entitled as “My experience about Hahnemann’s 50-Millesimal scale potency” in British Homoeopathic Journal. Hahnemann’s final decision in favour of high potencies resting on his concept of dilution and succussion was put forth in the 5th edition of Organon (1833). In 2nd edition of “chronic diseases” (1839) he confirmed his dynamisation of drug and in 5th edition “chronic diseases” (1837) he defines it as “Homoeopathic dynamisation are process by which the medicinal properties, which are latent in natural substances while in their crude state become aroused & then become enabled to act in an almost spiritual manner in our life; i.e. in our sensible &irritable fiber. This development of the properties of crude natural substance (dynamisation) takes place, in the case of dry substances by means of trituration in a mortar, but in case of fluid substances, by means of shaking or succussion, which is also a trituration. Hahnemann while practicing actively in Paris noticed troublesome medicinal aggravation in maximum cases even after using low potency as said in 5th edition of Organon which made him for revision of Organon & in turn gave birth to the 6th edition (1921) in his Organon, most nearly perfect of all, having new method of preparation of medicine in chronic diseases, its repetition & dose. In aphorism161 he termed this method as “renewed dynamisation (sec.247)”. It is a mathematico- mechanical process by virtue of which the inherited dormant dynamic curative power of drugs is aroused or increased by modifying drug strength or drug power to dynamic power through the process of dilution & friction in definite order. 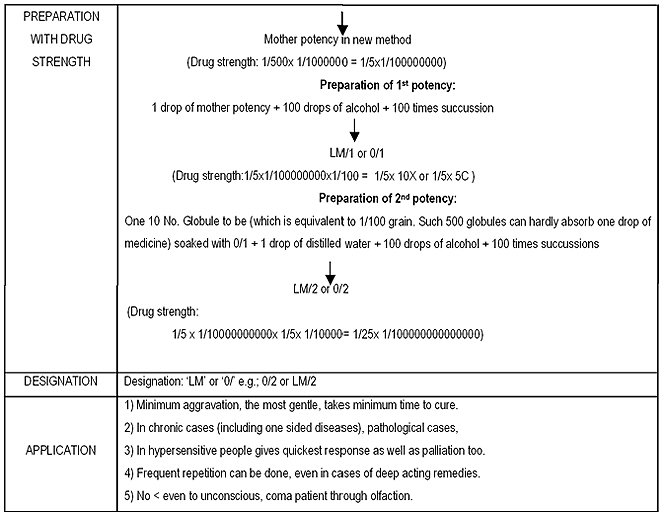 Adjustment and administering the LM scale of potency may be made in four or five different ways. The amount of water may be taken in 30ml or 60ml or 100ml and doses may be made in 8 or 10 or 12 or 16. Adjustment may be done by the teaspoonful or tablespoonful solution for administration, even adjustment may also be done in succussion according to the sensitivity of the patient. Administration required frequently oral or olfaction according to the pathological stage of the patient. Keeping in view the above and claim of Dr.Hahnemann of his last invention as “ …the most nearly perfect of all” in his 6th edition of Organon of Medicine we cannot dare to ignore it.